What Kind of Exercise Raises Our Metabolism? Since testing in a metabolic chamber is the most accurate way of measuring metabolism, I’d like to site a study, Knab et al, (2011) published in Medicine and Science in Sports and Exercise. A metabolic chamber is a small room where subjects can live while scientists measure precisely how they eat, sleep and exercise while also tracking how oxygen is consumed in the vacuum. Since other methods of measuring metabolism are not as accurate and since the subjects can not lie about how they eat, move or sleep, this study has great appeal. According to this study done on 25 year old men, a 45 minute workout on a cycle ergometer had an average energy cost of 519 kilocalories. 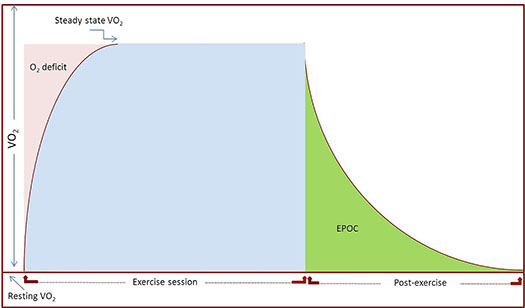 EPOC was elevated for 14 hours afterwards–an increase of 190 kcal compared with the control group of those who rested. Another study on how traditional resistance training compared to high intensity resistance training, Paeli et al, (2012) published in Journal of Translational Medicine, tested men (aged 24-32). The first group used traditional resistance training methods which consisted of 4 sets of 8-12 repetitions to failure (70%-75% of their 1 rep max) with 1 minute rest between sets for single joint exercises and 2 minutes rest for multiple joint exercises. The training lasted 62 minutes including a 10 minute warm up on the treadmill. The high intensity training group lifted to failure a weight comparable to the subject’s 6-RM (meaning subjects could do 6 reps but not 7 or more). After 20 seconds of rest they lifted the same weight to failure a third time (1-2 reps). They rested for 2.3 minutes then repeated the entire regimen a second and third time. The training session lasted approximately 32 minutes, including a 10 minute warm up on a treadmill. Ater a 22 hour period, the subjects were tested. The traditional resistance training group had an energy expenditure that was 5% (99 kcal) greater than their resting values. The higher intensity group’s energy expenditure was 23% greater (452 kcal). According to these studies EPOC is elevated after many types of workouts but mostly for high intensity resistance training, probably because that produces the most wear and tear on the body, thereby requiring more recovery. This month, I will be doing a workshop on nutrition that will cover nutrition and diet recommendations for athletic performance and fat loss. Learn which carbohydrates impact glucose levels, which proteins and fats we should be eating, and how to properly calculate your ideal caloric intake/output. All of the information to be shared are based on the latest studies and most up to date expert advice.